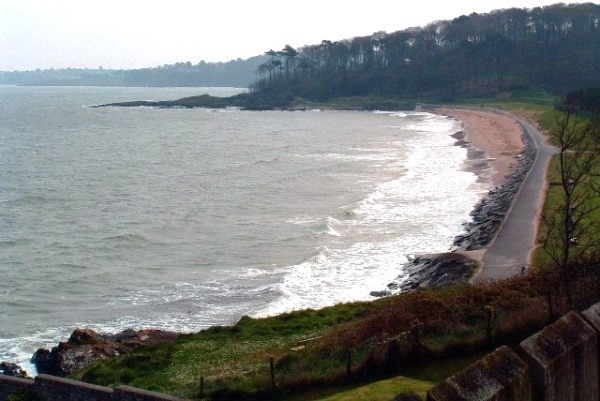 The North Down Coastal Path remains a gem in Northern Ireland’s tourist and leisure offering. 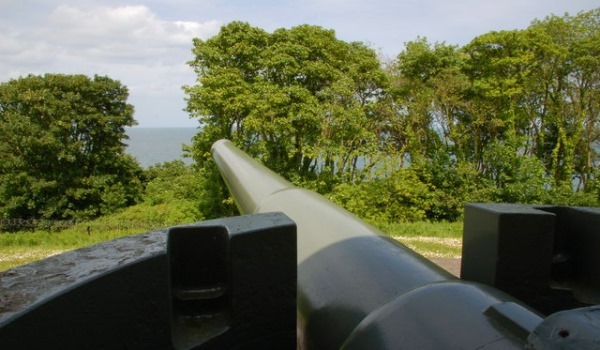 The section from Holywood to Bangor stretches 10 miles along rocky shores, fine sandy beaches, quiet coves, country parkland, busy promenades and moments of perfect isolation. This post celebrates the importance of the North Down Coastal Path, and looks at the work ahead to release its full potential. 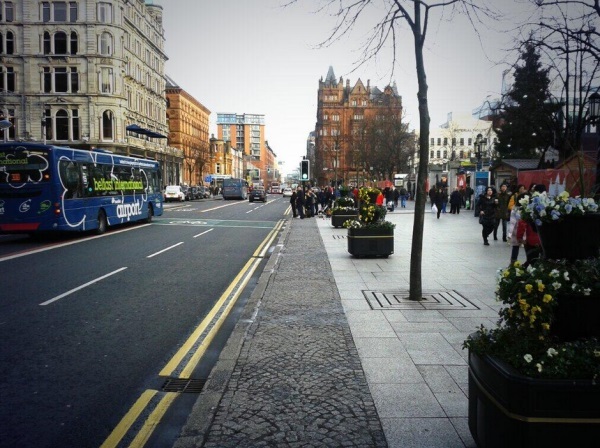 As a kid growing up in Troubles Belfast, there was always a little bit of magic about day trips to North Down. Whether it was the chocolate box train stations, the many fun activities, or just the sharp change of scenery just minutes out of the city, it was an easy place to fall in love with. Finding out that there was a ‘secret path’ that went for miles around the coast added to the mystique. 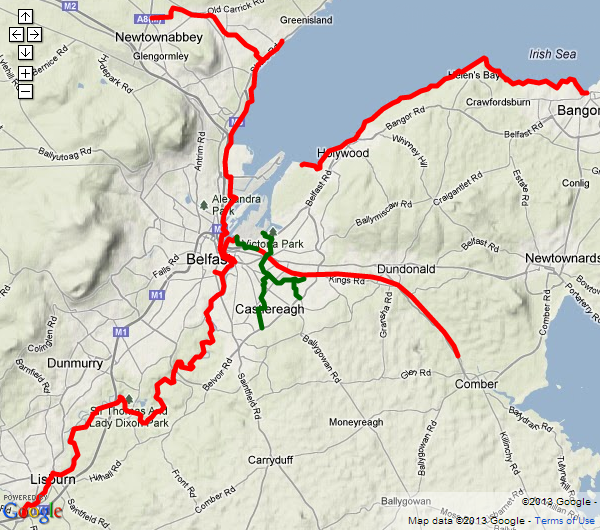 It later became a favourite adventure to cycle* from Belfast to Bangor and back. The attraction of the Coastal Path today is just as great. 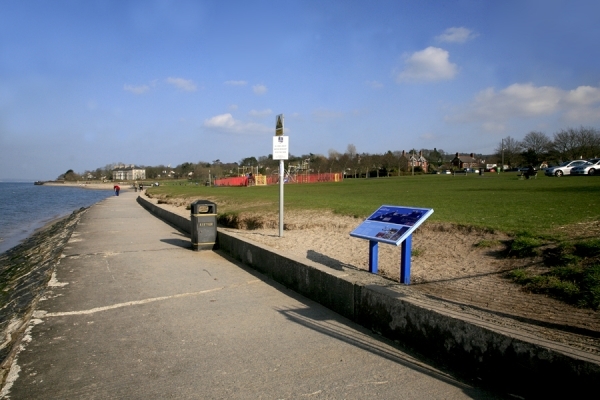 Starting on the Belfast side, the path begins around Holywood, starting its close relationship with both the sea and the railway as it passes close to Holywood Station. There are 8 railway stations from Holywood to Bangor and most are with 500m of the Coastal Path, making short trip options wonderfully flexible. 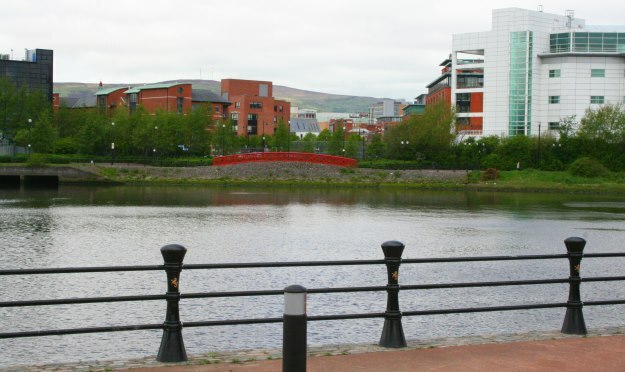 The section at Seapark, according a recent tendering process, will shortly be upgraded to enhance walking and cycling* access. Striking out from the urban environment the path passes playgrounds and millionaires’ retreats, mixing shared footpaths with residential roads. The first stop of major interest is at Cultra. The Ulster Folk and Transport Museum covers a large area on both sides of the busy A2 road, and the two sites have enough of interest for a day trip each. These museums cover a vast timeline of Irish cultural and engineering history. Unfortunately there is no direct access from the Coastal Path into the Transport Museum site, with a long trip up the nearby Glen Road and back down to the main entrance the only option. Onwards to Station Road, marking the end of the residential sections of the route, and a fierce contrast to the smooth promenades and streets so far. Crossing the boundary of the Royal Belfast Golf Club, a tight mud/gravel path clings to the shoreline, between crass fencing and artificial sea defences. Some sections near here are due for upgrade, but a comprehensive look at improvements to weak links in the chain is necessary. 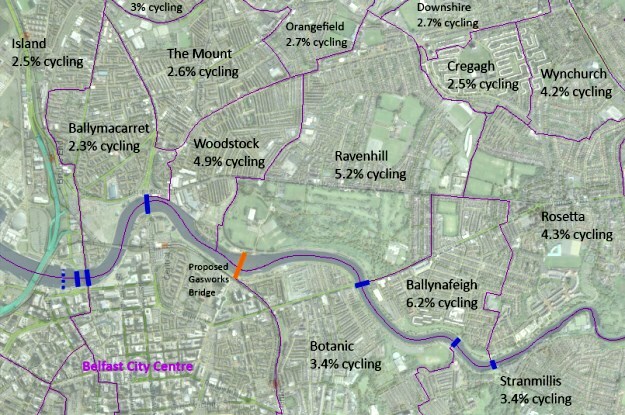 Comments on Twitter suggest commuters to Belfast from Seahill and further would benefit from a realistic option to cycle* somewhere other than the main A2. Improvement works have been seen in recent years, especially as we move on past the Rockport School. Approaching Seahill there is a rocky inlet which is traversed by two flights of steps and a high narrow path. This effectively cuts the Coastal Path in half for wheelchair users and anyone pushing a bicycle* who may be unable to lift and carry a bike up and down the narrow flights. 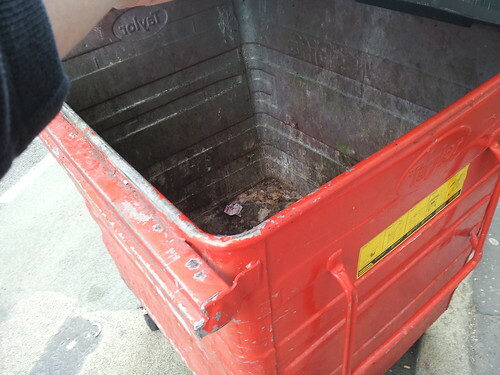 North Down Borough Council have been working with the Northern Ireland Environment Agency to provide a sustainable and environmentally acceptable alternative. 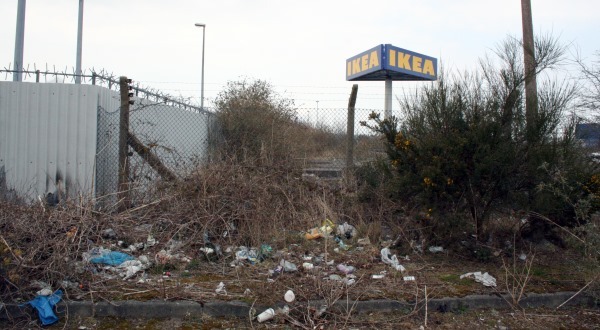 This is currently planned to be a boardwalk, level with the rest of the path. Once completed this will boost the potential of the entire route. A leisurely stretch brings us to Helen’s Bay, and as the path turns southeast towards Bangor, the Grey Point Fort dominates the headland. Sighting Scotland for the first time, a steep climb and a quick nip onto the local road finds us dandering down towards Crawfordsburn Country Park. On sunny summer days the beach and surrounding fields come alive with day trippers tucking into picnics and the sounds of delighted kids. Secluded woodland walks, waterfalls and spectacular railways arches lie in wait away from coastline. In days gone past the railway halt at Crawfordsburn allowed day trippers the option of a train directly to the beach path. Today the Helen’s Bay Station is still close, but the vast majority of visitors to Crawfordsburn Country Park still arrive by private vehicle. Passing the impressive Crawford House complex (read more about the history of Crawfordsburn Park on the Lord Belmont in Northern Ireland website), wide promenades have taken us across two beaches. Reaching Swineley Bay, the path stops abruptly and it’s a dander over the sand to the other side of the beach. Not too much of a problem for ramblers, joggers and dog walkers, but another difficulty for anyone with self-propelled transport*. The Coastal Path and railway line finish their game of hide and seek as the outskirts of Bangor are reached at Carnalea Golf Club. Leaving sandy beaches behind for more rocky shores, the path twists and undulates towards Smelt Mill Bay, naturally regulating any speeding wheels*. Turning round to face Bangor Marina, the Pickie Pool may no longer stand proud on this side of town, but today’s Pickie Fun Park shows how investment in new facilities can reap great rewards for a local economy. 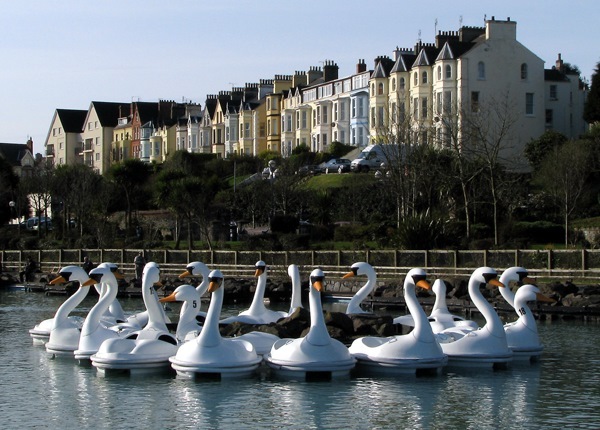 Tourism has influenced the development of Bangor since Victorian times, and although slow to respond to the changing holiday habits from the 1960s onwards, the town is beginning to thrive on smart investments such as the Marina complex and integrated transport hub. The North Down Coastal Path may be a small part of the overall package for Bangor, but with Belfast just a couple of leisurely hours away by bike* and tourism becoming more important to Northern Ireland as whole, the North Down Coastal Path should be given greater marketing prominence as a high quality active travel corridor. 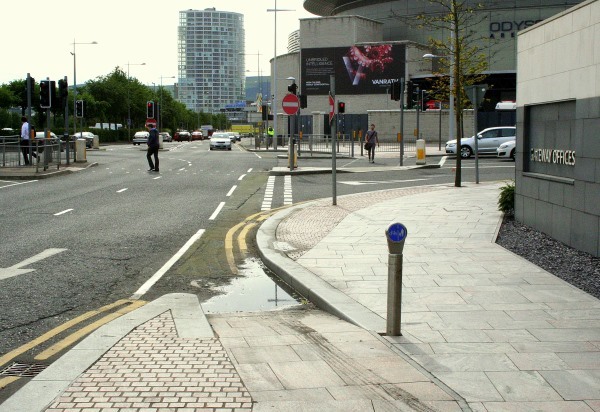 Two issues seem to dominate discussion of shared paths like this one, dogs and cyclists. 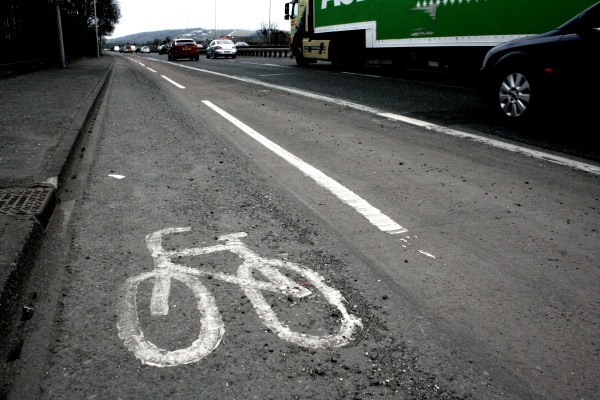 It may come as a surprise how the the issue of cycling has been settled – North Down Borough Council by-laws prohibit cycling on any part of the North Down Coastal Path. 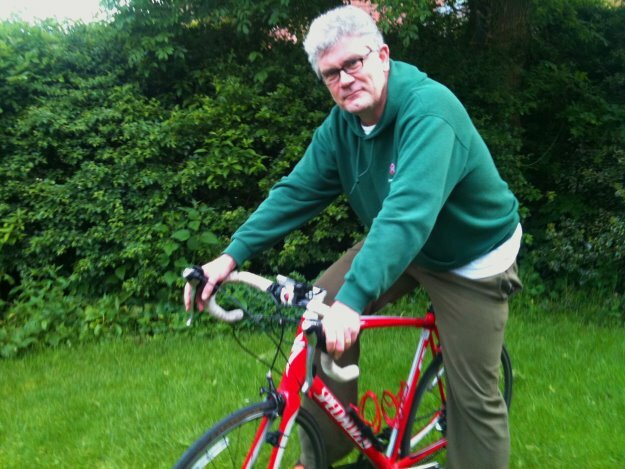 Hence the coy cycling* references earlier! 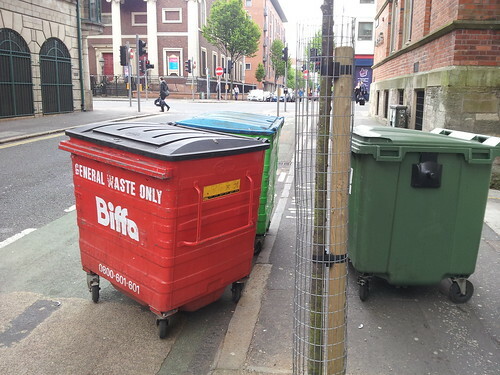 Councillors are actively working on solving this problem, now widely recognised as outdated and largely unenforced in practice. 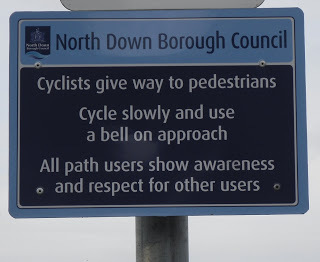 In fact, Council cycling information signs are common along the route, and leaflets on the North Down Borough Council website even promote Sustrans’ National Cycle Network as running on sections of the path. While mixing cyclists with ramblers can be difficult, the North Down Coastal Path for the most part naturally calms the top speed of leisure cyclists – either by tight twisting passages or the relentless glorious scenery to be savoured. This is not a welcome nor coveted environment for faster road cyclists or Strava junkies, especially as many sections are still suitable for a mountain bike only. 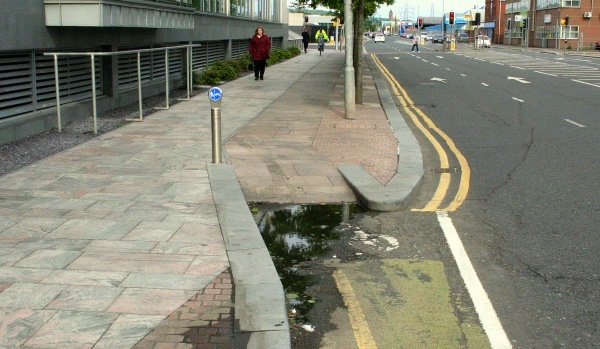 There is perhaps a more fundamental tension at work here between the interests of local users and those wishing to develop a route capable of attracting and handling higher usage. 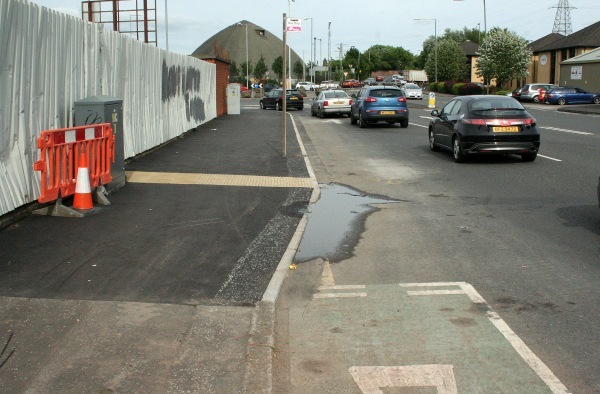 The same complaints play out on the Lagan Towpath and Comber Greenway, but everyone must face the reality that these routes are being developing as mixed use to maximise the numbers and range of users. Consideration and respect is necessary for a harmonious environment; prohibition is a blunt instrument which isn’t working and holds the path back. 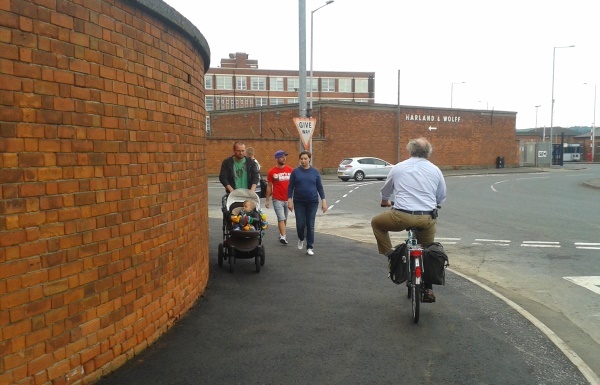 The local economy can only benefit from increased usage of the path by day tripping cyclists from Belfast, whether resident or tourist. Getting to the North Down Coastal Path from the Belfast side is challenging, and there is a need for a new traffic-free route into Belfast. 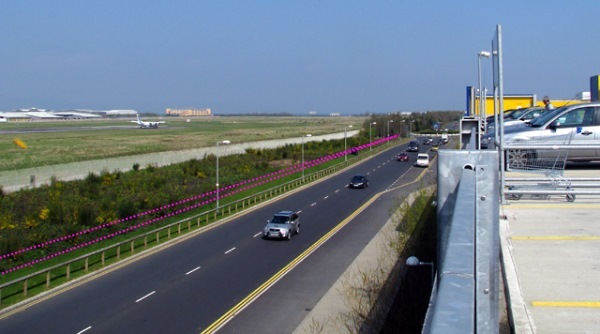 From The Esplanade in Holywood there is a quiet coastal road which leads to the entrance of the Belfast Harbour Estate at the end of the George Best Belfast City Airport runway. 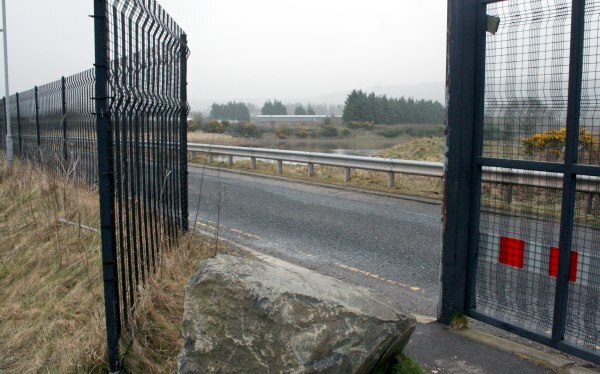 The road is private, owned by the Ministry of Defence as part of the Kinnegar Barracks, yet walking and cycling is so common and accepted that the gates onto the Harbour Estate are now permanently open. 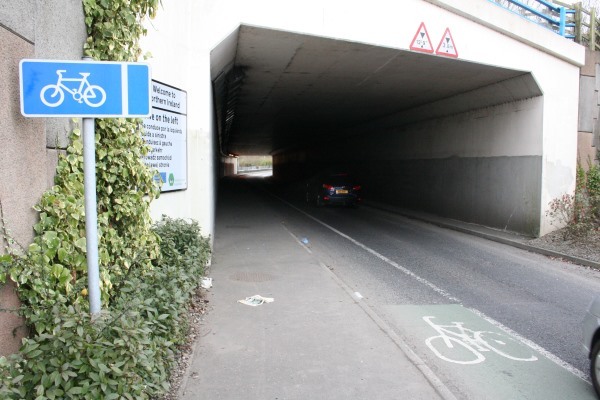 This is very welcome for local users but is only one hurdle to a continuous, fully accessible greenway route. 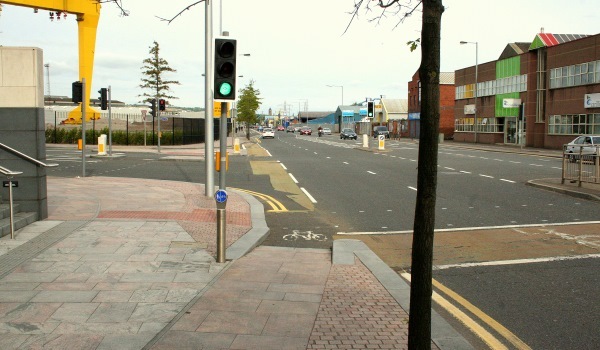 Just 100m from this opening are the Tillysburn Harbour Gates, operated by the Belfast Harbour Police. A sign here suggests overnight closures during the week and shut gates all day Sunday. In conversation with the Harbour Police, these hours were confirmed as open from 6.30am Mon-Sat, closed around 11pm each weekday, causing few problems for commuting and leisure. But the Sunday closure was also confirmed, with the gates locked at 7pm on Saturday night and not opening again until Monday morning – prime time for leisure use. 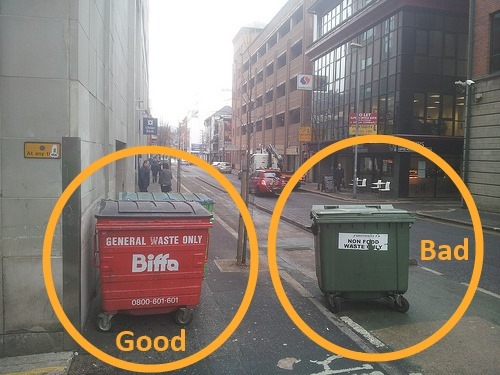 To make sure of the situation, I took trip down and observed wide open gates at 12pm on Sunday 21st April, obviously contradicting the only publicly available sources of advice. No accurate information available on the Belfast Harbour website at the time of writing. 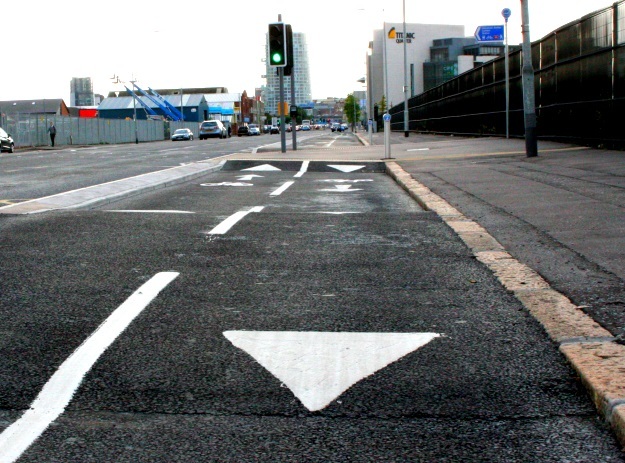 It’s a confusing situation for everyone – the very existence of a barrier shown as closed on Google Maps creates uncertainty – and clarity is required. In the first instance the Harbour website needs to be regularly updated with access hours, allowing all the relevant tourism sites to reflect the latest info. 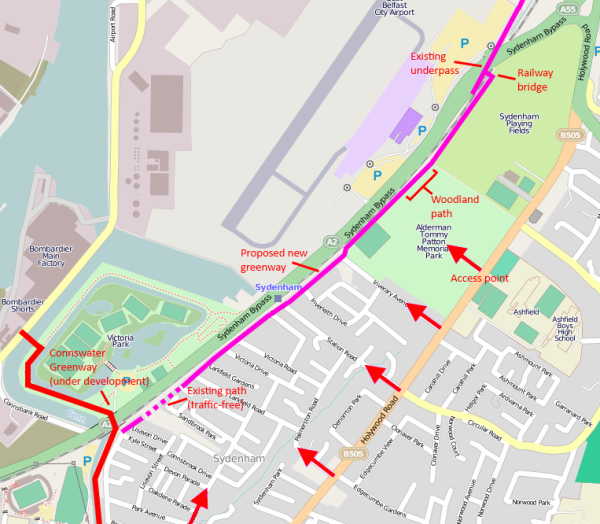 In the medium term, a more permanent arrangement for a continuous pathway makes more sense. This could be achieved either by setting the whole security barrier back by 150m to give a clear route through to Kinnegar, or developing a separate ‘greenway’ path away from the road near to the edge of the lagoon. 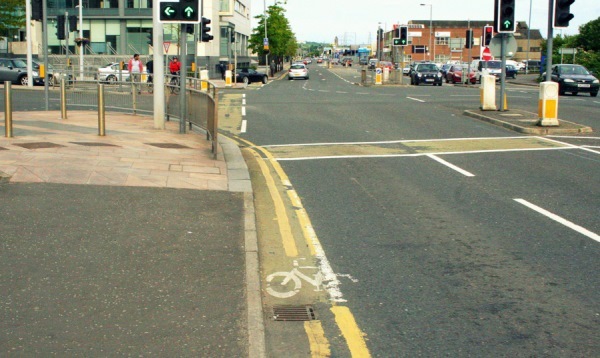 With the main A2 road unappealing for leisure cycling or rambling, making full use of this section for sustainable travel is essential for the future of the North Down Coastal Path. 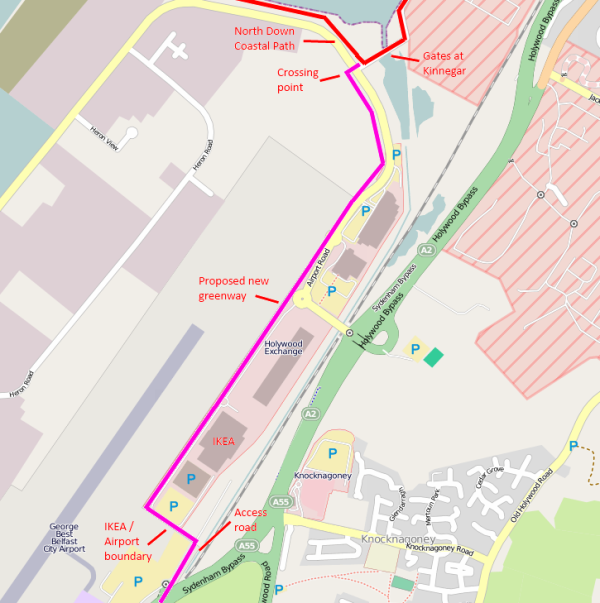 For more on the North Down Coastal Path and opening a quality link to Belfast read part two on the Belfast to Bangor Greenway: the final link.